At the annual general meeting of the EGHS Residents’ Support Group, there was a changing of the guard. After many years, Libby McCormick stepped aside as president, with Marlene Goudie moving into the position. She will be supported over the coming year by secretary Jane Richardson, assistant secretary Jackie Grimmer, treasurer Margaret Spong and assistant treasurer Lynne Wilson. Guest speaker at the AGM was Wally Pope, who spoke about his life’s involvement in music. 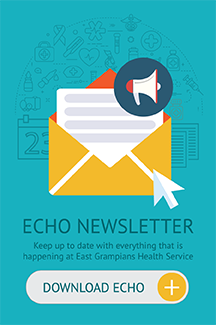 In May 2018, the Auxiliary decided to change its name from EGHS Aged Care Auxiliary to EGHS Residents’ Support Group. “The reason we decided to change our name was we wanted to get rid of the word ‘aged’. 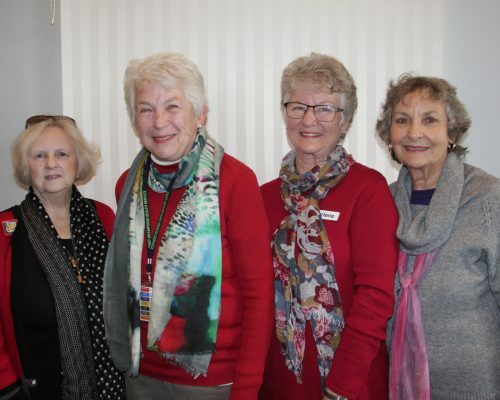 Not many of us wants to be reminded of ‘being aged’ and its conations but to reflect the attitude, passion and fun we have volunteering at 70 Lowe Street and Garden View Court,” outgoing president Libby McCormick said. Libby said members participate in many activities that don’t make the newspaper headlines, such as The Whistling Kettle at Lowe Street, The Tea and Chat at GVC a monthly high tea with the best of china, tablecloths and beautiful cakes, sandwiches and slices for a small group of four to six each time. Memories is a regular Friday afternoon event discussing a variety of subjects, which is a great history lesson of times gone by and always very interesting. At this time of the year footy tipping is very popular and taken very seriously as is the bingo sessions on a Friday and manicures on Mondays. Many members just visit and perhaps take residents out for coffee and drives. In December, Christmas Carols were held at 70 Lowe Street and residents from Garden View Court joined members, families and staff to enjoy an afternoon of great entertainment and afternoon tea. Nearer to Christmas the Group provided morning tea to both Garden View Court and Lowe Street with cards for each resident and Mitre 10 vouchers worth $300 so staff could buy plants and garden equipment. In November 2017 we had a Shopping Night at Harvey Norman, but this year on November 30 the Group is reintroducing the Shopping Spree involving the shops in Barkly Street. Other activities during the year included delivering 100 Easter eggs on Easter Sunday, Mothers’ Day afternoon tea and catering for the Rotary District Assembly. A grant was received from the Pitch Music Festival for massage mats at Garden View Court and we donated funds for curtains at Lowe Street. “My sincere thanks to EGHS Management for their continued support, the unit managers and staff at Lowe Street and Garden View Court who we know appreciate our efforts and make us welcome, and Leisure and Lifestyle Coordinators Bernadette Cincotta from Lowe Street and Cathy Billings from GVC, who both work very hard to coordinate the activities at each residence and keep our group informed,” Libby said. “I thank the members of the Residents’ Support Group. They are a wonderful group and the support and commitment is fantastic. We may be a small group in numbers, but for a bunch of ‘Groupies” we do kick goals.